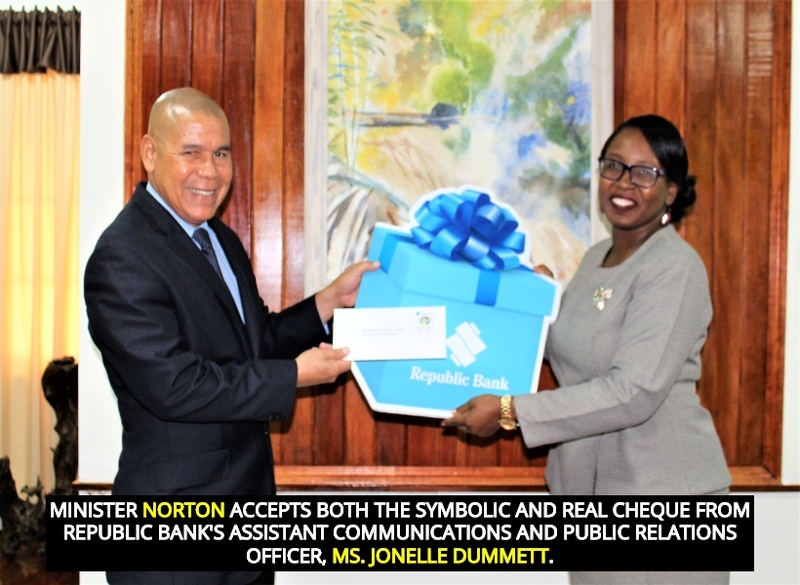 The Honourable Minister of Social Cohesion, Dr. George Norton today accepted a $3M cheque from Republic Bank Guyana Limited (RBL), intended for the support of Mashramani 2019. The monies handed over will go directly towards the hosting of the Pan-O-Rama Steel Pan Competition. The company’s Assistant Communications and Public Relations Officer, Ms. Jonelle Dummett, said that RBL is overjoyed at the evolution of the steelpan competitions. “During the past 11 years, we have recognised the growth of steelpan music in Guyana…we have seen the fruits of our support and we are just happy to be heading in the right direction as a corporate citizen,” Ms. Dummett said. Over the years, RBL has been a key partner in the resuscitation of steelpan music, investing approximately $30M in the development and maintenance of steelpan music in Guyana. According to Ms. Dummett, the company is fully committed towards continuing its support for the genre. Recognising the company’s efforts, Minister Norton expressed genuine appreciation for the support, calling for the rest of corporate Guyana to follow suit.